Project: Re-esign of existing site. 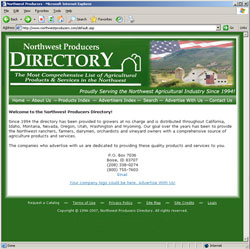 Project Scope: Since 1994 the Northwest Producers Directory has been provided to agricultural growers at no charge and is distributed throughout California, Idaho, Montana, Nevada, Oregon, Utah, Washington and Wyoming in print and on CD. 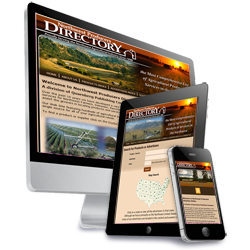 In 2007 the directory was taken on-line and Vortices Design was tasked with converting the directory to database. Their goal over the years has been to provide the Northwest ranchers, farmers, dairymen, orchardists and vineyard owners with a comprehensive source of agriculture products and services. The site is fully database driven allowing the owners to maintain the list of products and services and advertisers themselves. The site tools also include the ability to run advertisements in a slide show on the site pages using company logos on the home page and more complex advertisements on the products and advertisers index pages. The ads can be set to run for a specific amount of time according to how much time an advertiser wishes to purchase. Responsive - Mobile Friendly: In June of 2016 we converted the site to be fully responsive for all devices, PCs, tables and cell phones.